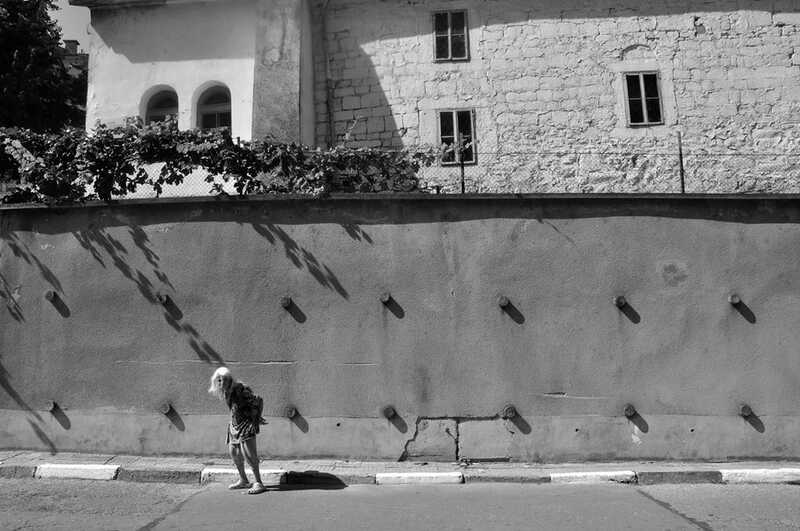 The Street Hunters Monthly Theme Contests have produced genuinely exceptional winning shots. We here at HQ expected great work, and, quite honestly, this year’s crop of winners have exceeded our expectations. Through the first five months, Roy Rozanski, Kristof Vande Velde, Christoph Wuzella, Sreejith Kaviyil and Zlatko Vickovic have not only cleared the bar, but also raised it! Needless to say we get a ton of submissions every month, and the work of these previous winners has made us better judges for it! June found us in the second instalment of a five-month stretch where the Monthly Theme Contests will be focused on colors. May kicked off the run with the color green, which was utterly crushed by Mr. Vickovic. June’s theme was the color red, the most passionate of the primary colors. We were anxious to see if we got flooded again with quality images. Well, we were swept away by a River of Red! But like we said before, the photo really had to stand out within the constraints of the color theme. A photo with just that color element would not be enough! The cream does indeed rise to the top, and for the month of June, Svilen Nachev has ascended to the peak with a cracking, clever shot that features one boastful banty with a bold red beard! The street photographer Svilen Nachev (on right), winner of the Streethunters.net June Theme Contest. Photo by Ventsislav Lalev. 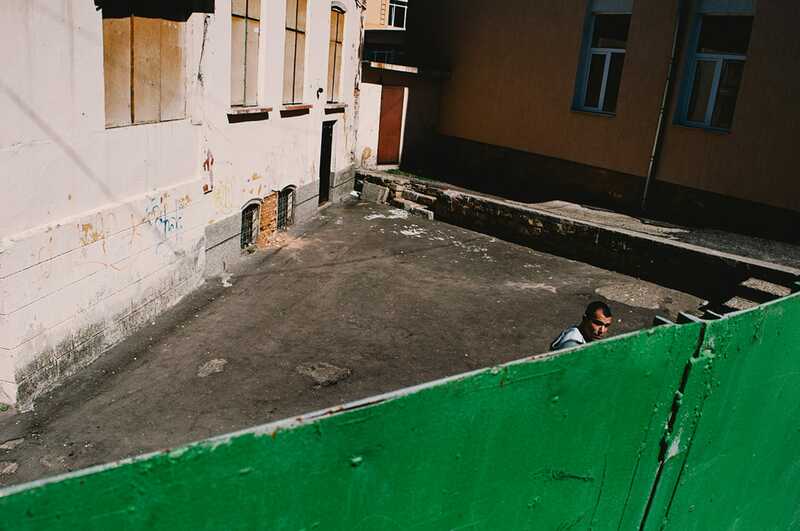 Svilen Nachev, who hails from Svishtov, Bulgaria, finds himself inspired by people, their reactions and emotions, their shadows, silhouettes, and places in the background. etc. and want to see the extraordinary in the ordinary life. “I just want to take better pictures, to leave a glimpse of what life was like to the next generations,” Nachev has said. He is also a known light stalker, saying “I choose places by their light. 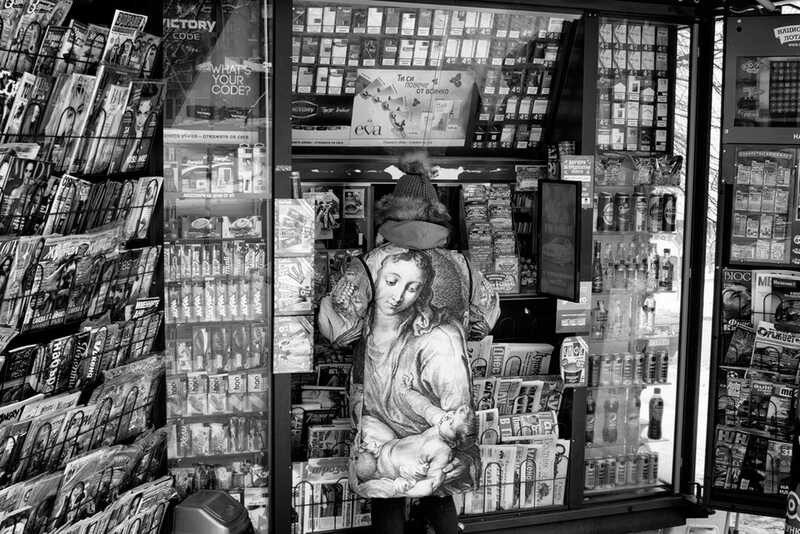 Sometimes I shoot when I walk around, other times I go places where I know that the light is good.” A member of the BULB Collective, Nachev is hoping to see some of his pictures at the final selection of the BULB Collective exhibition at the Miami Street Photography Festival 2017, where BULB will be the featured collective. Be sure to follow the links at the end of the interview to see more of Svilen’s work! First, can you provide us with some background information about yourself? For instance, where you’re from. How long have you been shooting? Are you a member of any photo collectives, groups or communities? Have you had any work published, shown in galleries, etc.? First of all, thank you very much for this interview! It’s an honour for me to win this contest of Streethunters.net – one of the few places in the net that someone can learn, be involved and be inspired in street photography. Thank you very much for doing all this for the genre! I was born in 1979 in small Bulgarian town on the Danube river – Svishtov, and am married with three children. I lived in a while in the UK, but now for good or bad I’m located again on the big river’s site between Bulgaria and Romania. I’m interested in photography from my teens and, like one of my very good friends said, I’m a National Geographic freak. I was always interested of photography, but started to shoot on the streets from 2011 when I bought my first DSLR – Nikon D90. 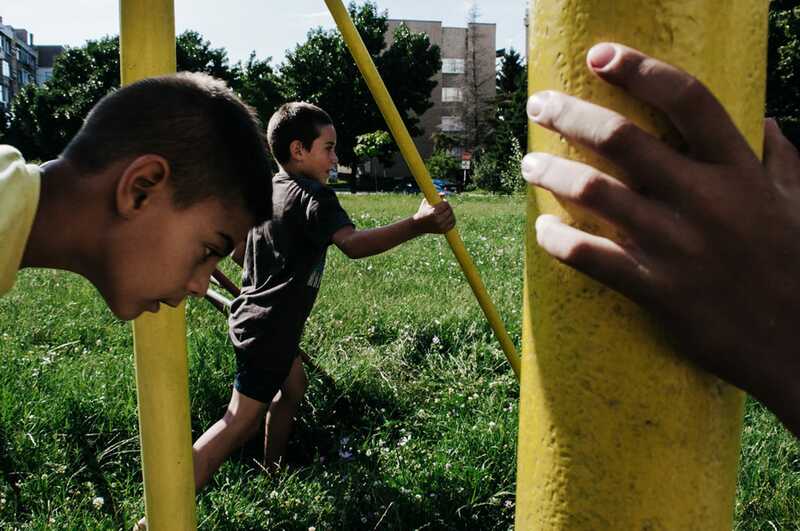 From January this year I became partner of BULB Collective (Bucharest Urban League of photographers for the Balkans). I still don’t have self exhibition, but I have publications in some group exhibitions and magazines. Tell us about this shot! The color red was the theme, but the action that’s going on within this shot is over the top! Tell us how this shot came together. What grabbed your eye first, the color or the action? I shot this picture at the marketplace in my hometown. I shoot there often, because like every marketplaces all over the Balkans, you can find some interesting people and be involved in some very interesting situations. To be honest the first thing that I saw was the rooster, so I wanted to build this kind of composition that its head to be the main object. 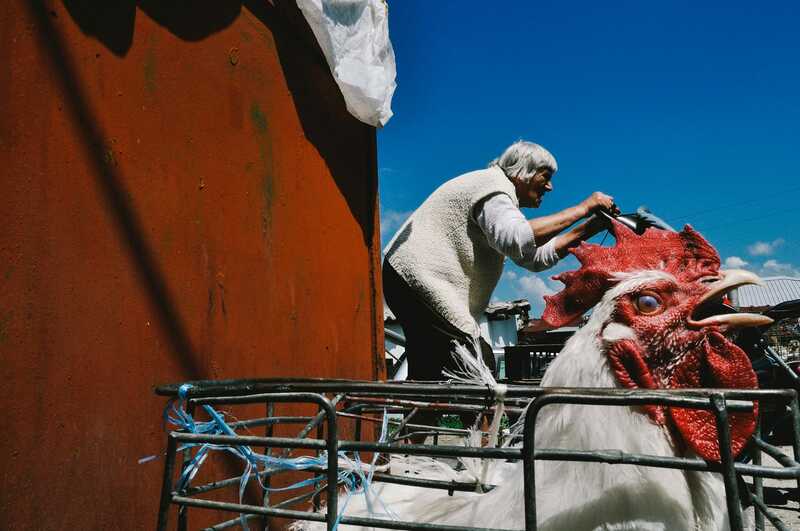 So I shot some pictures, but then I saw that because of the big difference in the distance between the rooster and the back people, that one of them will be not in focus. So I put my aperture on maximum value and I start to wait for something to happen. Meanwhile I saw that the wall behind the rooster is red and I wanted more white clouds in the sky. It didn’t happen, but now the blue sky is connected with the blue rope. Then I saw the lady with the white coat and I decided that this is the moment and it happens. How did you get into street photography? Whose work influenced you the most? First time when I saw the work of Henri Cartier-Bresson, I was blown away. Then I saw mostly of the Magnum photographers like Alex Webb, David Alan Harvey, Josef Koudelka, Nikos Ekonomopoulos, etc., some photographers that worked with the National Geographic like James Stanfield, Sam Abell, Jodi Cobb, etc. influenced me a lot. I try to see pictures from as many as possible photographers, even not famous ones, of course, from all over the world. From all of them I try to learn and be influenced. I don’t want to separate them and my advice is to be with open mind everywhere with everyone, not only with the “big names”. I wrote about here mostly of documentary photographers, this kind of photography is my “biggest love”, so I believe that street photography as part of documentary is my way for preparation for something deeper in the photography. 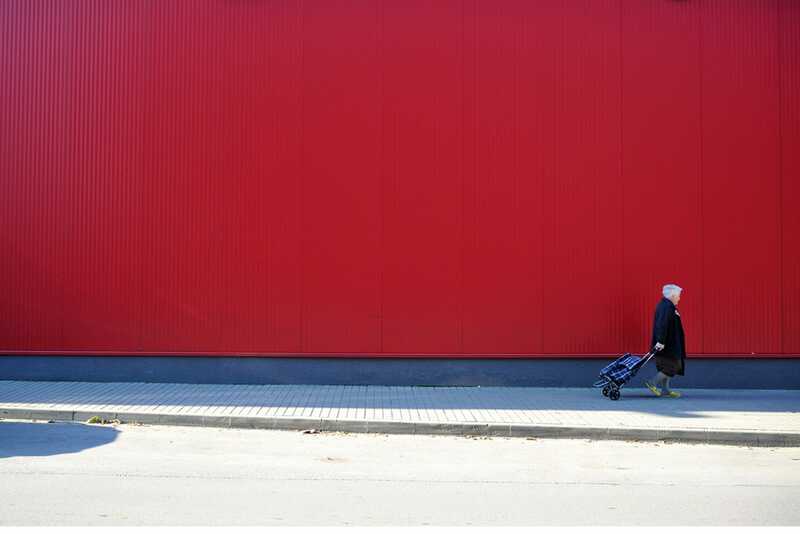 A lot of your street photos are incredibly abstract and, in some ways, almost dream-like. Does this stem from wider artistic influences, or is it simply the way you see the world around you? I’m very happy that you think like this for my photos. I think this is combination of artistic influences and the way I want to express myself. There is a little rule that I follow – I try to make a picture that I will like to see. But sometimes is very hard to not shoot cliches and to not shoot something that you see from someone else’s picture, but to be with your own style is one of the hardest things these days. My favourite length at the moment is 28mm (full frame equivalent). I still use my Nikon D90, now with 18-55 zoom lens (I made the winning picture with this gear) and I use it only on 18mm (Nikon don’t have 18mm DX prime lens). When I shoot on film, I use Nikon FG-20 with 28mm prime lens. Hope I’ll upgrade soon with something smaller and lighter. 🙂 I use this focal length because I want be in the action, if someone looks my photos to feel like he’s there on the same place at the same time. I think that 28mm gives me a lot of that feeling. In an interview at www.streetcorephotography.com, you’ve said that you “want to see the extraordinary in ordinary life.” Do you find that task becomes easier the further you go along, or does it remain a challenge? I think now that this is а much bigger challenge. I’m a photographer who don’t want to repeat myself, but this is very hard to do. It’s very hard to escape from yourself, to learn yourself to see something new, in different positions, from different angles, etc. I’m trying this all the time and I’m not afraid to make mistakes. Your most recent work shown in your Flickr photostream is color and the majority of your previous work is in black and white. Does this mark a permanent change in your style, or will you shoot both? At the moment is permanent, but never knows. I shot in black and white till April this year, but then I decide to challenge myself, not because I’m very satisfied with my black and white work but because I live in very small town and the places and the people are starting to repeat in my pictures. For now I think that this is very good challenge. I try to learn more about the colours, about the light and the composition, about how to shoot not only facts, but feelings, as my friend from the collective advised me once. Does color vibrancy factor as much into you color work as the strength of contrast does in your black and white work? I don’t think that we have to compare colour photography with black and white. I think that they are completely different planets. The vibrance, the contrast, the composition, etc, everything depends from the situation, the object, the place, the light etc… I’m searching for myself to find “my tones” of the colours. You’re a partner with the great BULB Photo Collective. What kind of impact has that had on your photography? To became partner of BULB Collective is the best thing that happen in my photographic life. I can say that in this collective are one of the best photographers in the world and I’m always inspired, challenged, provoked by their work. I heard about the collective last summer and I thought how I didn’t knew nothing about this incredible collective. Now I’m very happy to be part of it. This year BULB will be featured collective at one of the most prestigious festivals in the world for street photography – Miami Street Photography Festival. 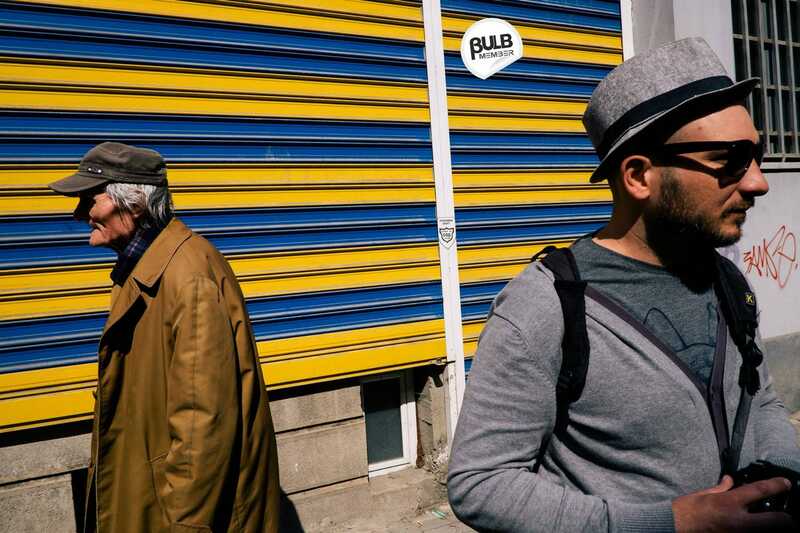 This year BULB is main partner to PHoS (a street photography festival in Athens, together with Streethunters.net) For anyone reading this – you won’t want to miss it! Where do you do the bulk of your shooting? Where is your favorite place to shoot? I shoot everywhere. I always carry my camera with me (that’s why I need smaller and lighter one). I don’t think I have favourite places to shoot, but I think I prefer at the moment places with much more people like big cities. I think this is because I live in small town, with not much people around me, so you know, everyone search this what you don’t have. 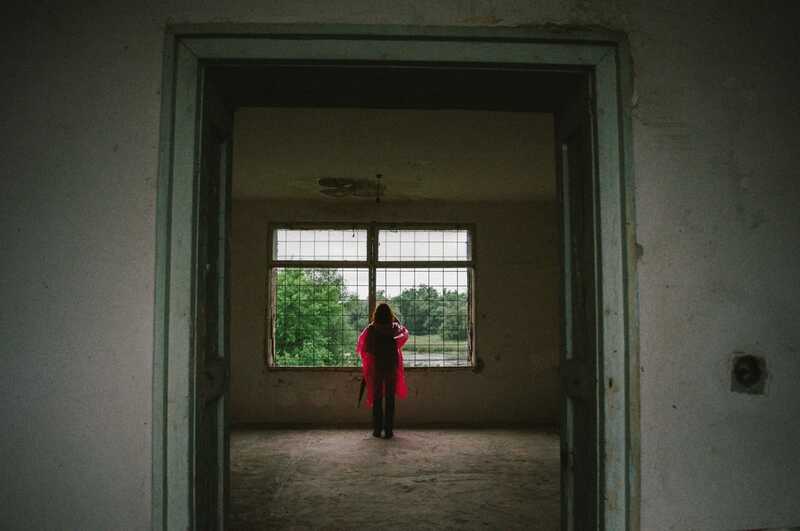 You recently shot work at the site of the Belene concentration camp, which was part of the network of forced labor camps in communist Bulgaria. Tell us about that experience. I always wanted to go there and to see this place with my eyes. This place is part of Bulgarian history and part of communist era, like GULAG for Russia if you know anything about it. It’s ironic that is only on 25 km from my town, but you can’t go there whenever you want. You can go there only on the day of this pilgrimage. This camp is built on the biggest Bulgarian island on the Danube river. Nowadays on the island there is a working prison, so there are a lot of restrictions not only to visit there but for making pictures too. This year I decided to go there and try to shoot. 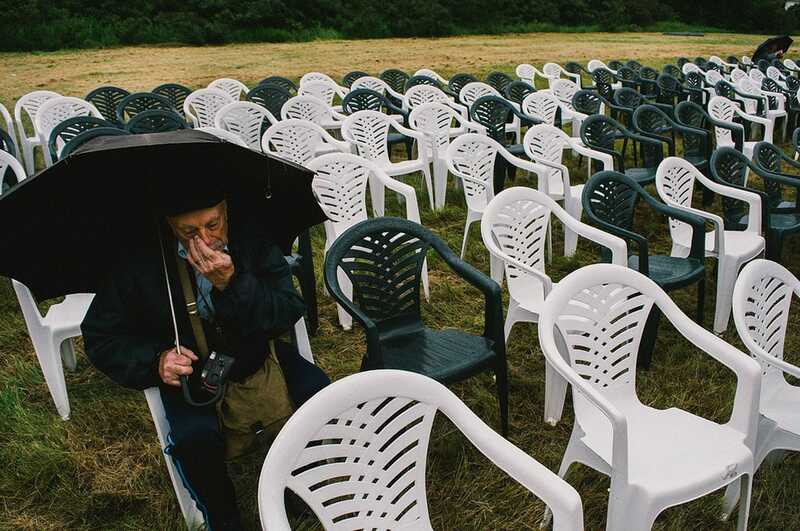 The weather was cold and very rainy for the end of May, and the old people who were visiting there said “and the heaven cries about the victims”. It can be seen in the light and colours of the series I made. My main goal was to capture the emotion of this place and feelings of the people who was there. I hope with my pictures you feel the same like I felt there. 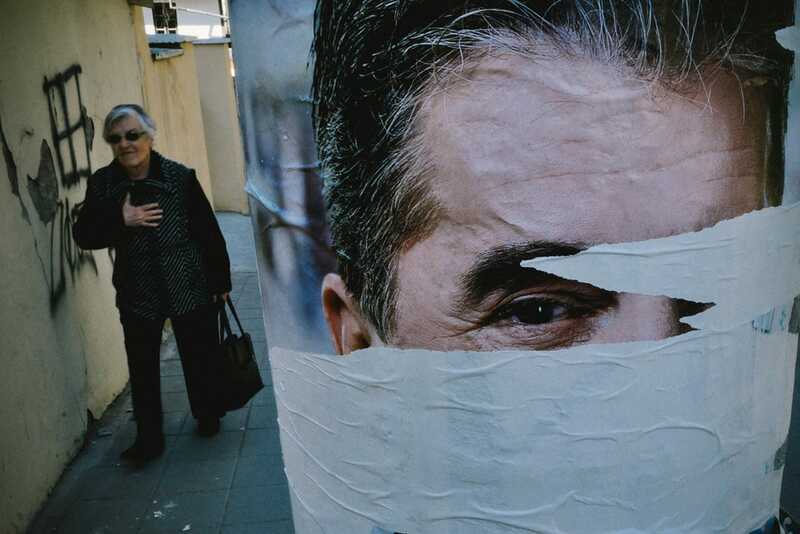 When shooting at Belene, did you find yourself using your street photography experience in your approach? The experience to think fast, to search for the light, to see the motion, to search for the geometrics, to search for interesting faces and emotions, to not be scared to shoot close to people, all this comes to me from the streets. I’m fast enough to catch something, but sometimes I have to be more patient and wait to see the feeling and to grab it. Sometimes I catch myself that I’m in a hurry to not miss anything like on the street, but in this place everything was very calmly. I think that street photography is very good entry level way for the documentary photography. 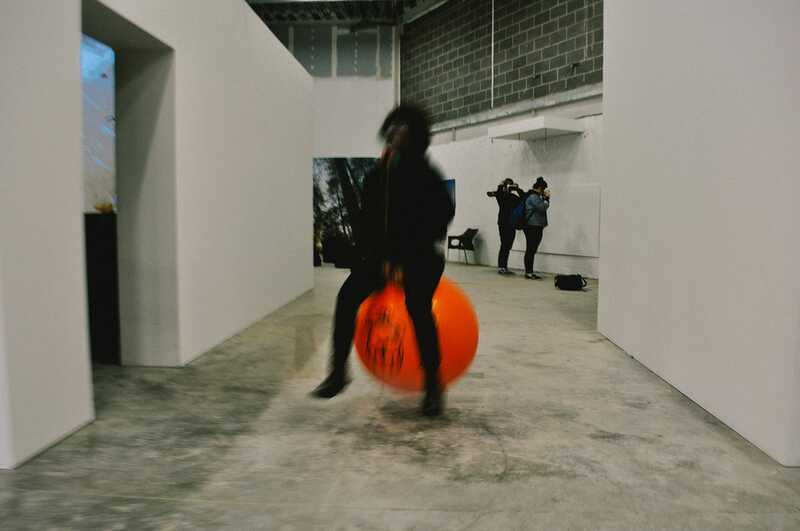 Stay in touch for every group exhibition of BULB Collective. Hopefully we will soon have an exhibition in Sofia, Bulgaria. Hope to see some of my pictures at the final selection of the BULB Collective exhibition to the Miami Street Photography Festival 2017 too. Stay in touch at http://bulbphotos.eu/ to see all my future publications.